Making marijuana-infused chocolate bars, sodas, oils and patches can be a highly profitable endeavor. 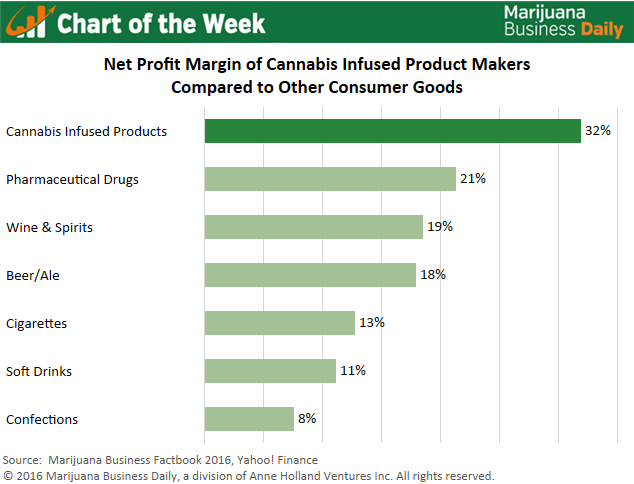 Profit margins for infused products and concentrates companies in the cannabis sector typically hover around 32%, according to data in the 2016 Marijuana Business Factbook. That’s significantly higher than the average for businesses that make other consumer goods such as alcohol, soft drinks and cigarettes. The relatively high profit margin for companies that make marijuana edibles, topicals and concentrates shows why entrepreneurs are rushing into this part of the industry in states that allow the production and sale of infused products. Demand for these forms of cannabis are booming, and consumers are often willing to pay a pretty penny for them. Edibles in particular are growing in popularity, particularly in recreational marijuana markets, as are concentrates used in vape pens. Nearly four out of 10 infused products companies that are currently in the black realize net profit margins of over 40%, according to the Factbook data, which was gleaned from a survey of cannabis professionals. As with everything in the marijuana industry, though, average profit margins can vary greatly by state or even city. In heavily regulated states like Colorado, profit margins are typically lower. Infused product makers are well-positioned to build brand loyalty and expand across state lines, which an increasing number of these companies are doing. This sector also represents an area of tremendous opportunity within the industry.